Nederlands Dans Theater was founded in 1959 and with some 600 works in its portfolio has been one of the most influential global companies. It has a mandate to seek a confluence between the discipline and training of classical ballet and experimentation with a wide range of often emerging choreographers. In 1978 a second group Nederland Dans Theater 2 was formed to develop young dancers with an eventual goal of joining the main company. There is also a third group comprising senior dancers. In this most athletic and physically demanding of art forms the three divisions allow for distinct beginning, middle and end of the career of dancers. 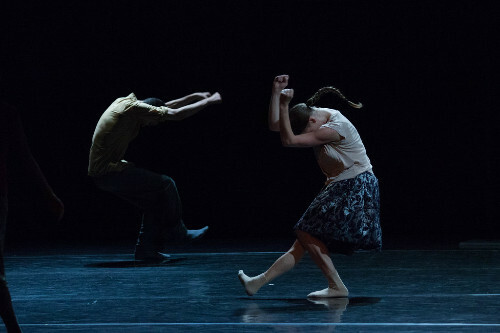 This week the second company is performing at Jacob’s Pillow for the first time since 2007. The initial impression was a shock of the new as the movement was out of our comfort zone. As the evening evolved with five pieces and two intermissions, while very different in tone and texture, one adjusted to the unique dance vocabulary of a richly varied, deeply experimental, and an ultimately truly satisfying encounter with a world class company. It is a norm that one has come to expect in the 17 years of artistic director Ella Baff. Her usual introduction of the company was particularly poignant last night as it was announced this week that she is leaving Pillow to take a position with the Andrew W. Mellon Foundation. The first piece I New Then set to a suite of five songs by the Irish soul and blues musician, Van Morrison began in silence with two male dancers slowly beginning to move in unison. The choice of Morrison was particularly evocative. He has a unique vocal delivery which seems oblique. The songs instead of being pitched straight at us are more like a knuckleballer. They dodge, float and feint their way to our ears. His style is often strained and rather back to front bending and evoking a wide range of emotional responses with slurred and scrambled lyrics. The selection of songs also expressed the range of his style from full bodied electric guitar, simple and direct, to the full horns and brass section of a soul band. There were variations of pas de deux and pas de trois as well as ensemble sections. The dancers were attired in variations of normal or street clothing. Initially, there seemed to be no attempt at a narrative to sync with the lyrics. This appears to be a norm for the company as we noted vividly in a later work, a pas de deux, set to the music of Schubert. An operative understanding was evoked from the notion of torsion, or turning around a central axis, which was a concept of high classical Greek sculpture. Think, for example, of Myron’s "Discus Thrower." The dancers used their entire bodies with the movement of arms often initiating a response of the full body. The feeling was essentially modernist as through the entire evening the male dancers remained grounded. There were classical lifts, but in an odd manner, during the more balletic Schubert piece. In the Morrison suite it soon emerged that the most inventive, lead dancer if you will, was the amazing Spencer Dickhaus. It was just astonishing to watch his moves. There is no ready, accessible vocabulary to describe them. The elements of his body at times seemed to be functioning independently. He was all akimbo while remaining in complete control. The Morrison suite evolved into a narrative. On one side of the stage were vertical poles that represented initially a forest and then the bars of a prison. At first a male dancer seemed to be observing the group from woods. Slowly he was joined by a woman sharing the space and engaging in an intimate process of removing their clothes prior to making love. This drove the character of Dickhaus bonkers with jealously. It evoked a paroxysm of frenetic movements signifying the extremes of frustration and despair. This was accompanied by a screed of incoherent utterances. His dance and screams were interpreted as funny evoking strident laughter from a row of teenage girls in the middle of the audience. I found that distracting. While comical his frustrations were more poignant than funny. There would be more to come from Dickhaus as the evening evolved. The second work, a pas de deux, Shutters Shut, set to a reading of the 1923 poem “If I told him: A completed portrait of Picasso” by Gertrude Stein was flat out fabulous. Having flunked freshman chemistry I made it up in 1960 at Harvard Summer School. I just hated being in the lab all summer but it was fun to hang out in the Yard. A group of us listened to recordings in the Lamont Library of poetry recited by the authors Stein, Dylan Thomas, T.S. Eliot and others. That initiated a life-long love affair with Ms. Stein who was the true giant of the Lost Generation. There seems to be a love-hate relationship with her work that regularly endures cycles of being in and out of fashion. Reviews in the Boston Globe and Albany Times Union damned Stein with faint praise revealing that the critics have not delved deeply into the originality and brilliance of her work. Get with it kids. The text and wonderful reading by Stein makes perfect sense. She was experimenting with sound and rhythm. How utterly brilliant to use her strongly accented reading as “music” for the spectacular, no literal, stark and stunning duet of Spencer Dickhaus and Imre van Opstal. The strong lighting and crisp black and white costumes evoked tricks with my eyes and a blinding, blurring moiré effect. The brief and stunning dance evoked an overpowering physical response as I struggled to see and understand what they were doing. During intermission, fortunately, my eyes returned to normal. For a panicky moment there I thought we would spend the rest of the night in the emergency room. For Sara the company danced as a slow moving, tight cluster to techno music composed by Ori Lichtik. They were attired in flesh toned unitards which evoked a primal otherworldly ambiance. To one side was the dancer Van Opstal. The work appears to be about her but abstracted beyond ready comprehension. Looking out at the audience at times she softly repeated indistinct lyrics. While a unison piece yet again Dickhaus appeared, other than Opstal, to be the primary dancer. The classical music of Schubert’s “String quintet in c-Adagio” would seemingly inspire a balletic dance. We have come to expect that when other contemporary companies similarly choreograph to traditional concert hall performances. But here the dance with variations of lifts found Yukino Takaura wrapping around and seemingly merged into a single form with Alexander Anderson. It is not entirely clear when Schubert elides into Some Other Time with the multi part music of Max Richter. Initially one feels like the extension of the other until a break comes in the form of modular black flats which are manipulated into a number of configurations. Dancers at times peer in from the wings or in one instance glide slowly across the floor adjusting over a roller. There are signifiers of loss and despair. At times individuals lean forward at an angle with their heads against the wall. By the end of a long program it was challenging to remain focused. This is an instance where less would have been more.